Sister Catherine Grams, SNJM departed this life on July 13, 2017 at Marie Rose Center, Mary’s Woods, in Lake Oswego, Oregon. 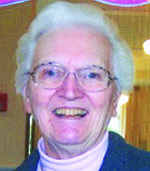 Sister Catherine had celebrated 90 years of life and 70 years of religious profession. Sister Catherine Grams (Sister Mary Michaelann), age 90, died at the Marie-Rose Center at Mary’s Woods in Lake Oswego, July 13, 2017. A member of the Sisters of the Holy Names for 70 years, her funeral will be held at 11 a.m., July 26, 2017, in the Chapel of the Holy Names, Marylhurst, Oregon. Sister Catherine Grams, the first-born child of Michael James and Frances Slaird Grams, was born in Portland, Oregon and lived in Northeast Portland all her youth. She attended Holy Rosary Grade School and graduated from The Madeleine High School in 1944. Catherine had a problem most people would envy. Her talents lay in several directions. She was tall and strong and an athlete and enjoyed being a fine athlete. Because her father died when she was five years old in the midst of the Depression, money was short, but her mother found a little cash for Catherine to have piano lessons and she loved music all her life. Her fine logical mind drew her to science and mathematics and it was there she decided her future plans. Catherine entered the Sisters of the Holy Names at Marylhurst in July 1945. Her ministry in teaching began in high school. She first taught at The Immaculate High School in Seattle where she made lifelong friends. To this day the students and their families, particularly the Kehoe family of Milwaukie, remain close, invite her to weddings, baptisms and memorial services and consider her part of their family. She also taught at St. Mary’s, The Dalles; Sacred Heart Academy, Salem; St. Mary’s High School, Medford; Marylhurst College; and twelve years at St. Mary’s Academy, Portland. All the while she was teaching she was earning a master’s degree in chemistry from Gonzaga University, Spokane, and later continued her studies obtaining a master’s in religious education from Fort Wright College, Spokane. She also attended the CREDO program at Gonzaga. From there she moved to a new ministry in religious education. This ministry took her around the countryside, but particularly to the beach including Newport and Tillamook, which brought her great delight. The list of Catherine’s other ministries included: driver for the Provincial House Sisters, charge of the Sisters’ beach house, companion to medical appointments, etc. For four years she served as pastoral associate at Our Lady of Sorrows, Portland, and worked in downtown ministry for the Jesuits. After retiring Catherine moved to Tillamook Town House, attended liturgies at St. Philip Neri and spent long hours in prayer amid her beloved plants and blossoms on her patio. Sister Catherine was a planner. At the beginning of the school year when other teachers were racing to get a couple of weeks ahead, she had planned the entire school year. When the forms for funeral arrangements first appeared she finished hers immediately except for the “date of demise”. Now her plans are complete and she is reunited with her mother and father and all are caring for Mary Anne. Sister Catherine is survived by her sister Mary Anne Grams and the members of her religious community. Remembrances may be made to Sisters of the Holy Names, P.O. Box 398, Marylhurst, OR 97036 or online at www.snjmusontario.org/donate.